In memory of Hedrick Isley, with love and gratitude for sharing his tobacco barn with us kids. It appeared to June Ellis that her Easter vacation was about to be ruined in several different directions and on sundry levels. “It’s going to be a spectacular Easter,” her daddy declared several weeks in advance. Then he casually delivered Easter’s death-blow: “Your aunt and uncle from up Cincinnati way are coming to spend spring break and Easter weekend. You’ll get to meet your only cousin, Ethan!” He held up his palm for a victory slap, but June ignored it. Distance had been her cousin Ethan’s single attractive quality. Four months her senior, throughout the eight years of their nearly consecutive lives he had naturally reached many important milestones before June could. He had talked, walked, and sprouted a tooth first, then he had taken up piano lessons and soccer. June was sick of hearing about his achievements. Now he was coming here, to her part of the world, and at the season that she most loved. She knew his coming would add nothing and could only diminish the pleasure she took in egg-dyeing, egg-hunting, and having her picture taken in a new dress in front of the lilacs. Sharing these things would turn all her joy sour. “You’ll wait for your cousin Ethan,” Mama said flatly. “Now finish your supper.” Where Daddy would cajole, employ sweet-talk, and tease, Mama forged iron rules and regulations that came down hard and left a mark. After supper June climbed up the tier of logs inside the old tobacco barn at the edge of the woods. The barn had not been used in decades except to shelter the lawnmower and garden tools, but it still smelled faintly of sweet golden leaves. At the top of the tall, narrow barn was a tiny window, a fine observation post. Daddy had fastened a sturdy board across two of the upper logs to give June a platform. He knew she loved to look out that window, so it made sense to give her a more secure perch and save her from leaning over to the window from one of the side tiers. Even with this improvement June’s mother was lobbying furiously to have the barn torn down before someone got hurt. But June relished her view over the house to Weddlesville Road. When she looked to the right, the road ran straight and true for three miles, ending at State Road 79, a mostly rural byway that meandered from the town of Ark to the south until it reached the more bustling city of Grantham, 75 miles north. To the east, Weddlesville Road curved into green woodlands and disappeared. Presumably, the road led to Weddlesville. June had never gone in that direction in her entire life. Church, school, commerce—everything of value was located somewhere on or near State Road 79. State Road 79 also brought Ethan and his parents. June sized him up in a day and a half. He may have been four months older, but he was no taller than June and not one bit bossy or arrogant despite his age advantage. He did not offer to play a tune on the piano, and June got her own way during the egg-dyeing and decorating project. She kept her management low-key so as not to arouse adult displeasure, but Ethan proved agreeably compliant. He had strong lungs and turned red with blowing out the raw eggs—always a difficult task. Besides this, he revealed himself to have excellent taste. June was flattered, and said he could have it. Her mother found him a wide-mouthed Ball jar with a two-piece lid. Ethan padded the bottom of the jar with a little grass from an Easter basket and nestled the egg inside. Ethan’s voice was husky and low. June imagined that he sounded like the state of Ohio. He seemed exotic, somehow, though he dressed the same as anybody. There was something about the light in his clear gray eyes, the life in his dark bristly hair, that reminded her of Weddlesville Road—a mystery, unknown and unknowable. She found her animosity toward him unsustainable. After their egg-dyeing and a riotous three days of hiding, finding, and sometimes crushing eggs, she had shown him her platform at the top of the tobacco barn. They were there now, having finished Easter dinner and changed into their regular clothes. “Where do you reckon that road really goes?” Ethan asked. He was crammed uncomfortably into the window with June, but she couldn’t push him out of the way without risking both their lives, since their platform was thin and a slip would take one or both down a good 25 feet into the dirt below. Not that the fall would kill them, but it would surely hurt and Mama would pitch a fit and no doubt have the barn sealed shut. “Wonder what it’s like.” He turned toward her, and she noticed again that his gray eyes had a strange light in the back, as if stars in a distant galaxy shown there. “Let’s go find it,” he said. The minute they turned the corner and were out of sight of the house, the air felt cooler and foreign. The abundant greenness of the woods pressed at them from both sides; tendrils crept toward the asphalt and climbed the road sign posts. June chose to walk down the center line of the road. “We’ll hear a car coming from a mile off,” she promised. “What if it’s an electric car?” Ethan wondered. June moved toward the shoulder, and they walked on the painted line at its edge. “We ought to build a summer camp out here,” Ethan said. “Have you ever been to camp? I’d like to run my own place. We’d have nothing but fishing and boats, swimming and horses. You could run the arts and crafts part. We might have to dig a pond.” He spotted something in a thick tangle of deadwood and weeds near the ditch, and down he went to see about it. Ethan extracted the balloon from the ditch, a procedure that ate up a bit of time and required careful untangling of the long blue ribbon that was snarled among the deadwood. Finally the balloon popped up into the air, only slightly low on helium, and Ethan’s eyes glowed with triumph. The balloon bobbed and dipped on the ribbon, and then a light gust of air seemed to raise it up, and up it stayed. June expected Ethan to release the ribbon and let the balloon fly free, as if it were a live wild thing. Instead, he tucked the end of the blue ribbon firmly into his front jeans pocket and let the balloon jerk along beside him. The road wound up a good-sized hill, and the cousins felt more hope with every step that at the top they would finally see their destination. But when they reached the summit, they saw only more woods and some abandoned fields further ahead. Ethan stood still and was quiet for thirty seconds before the silence ended. June and Ethan lifted their heads like bird dogs. They realized that they stood at the corner of a yard. The front lawn was nearly indiscernible for a riot of growth at the corner—periwinkle and creeping phlox; loose-limbed forsythia; thick, wild azaleas; ungroomed beds of past-blooming daffodils and hyacinths—all of it mixed in with an encroaching green-woods growth that blurred the edges and threatened the stability of a small section of driftwood-gray fence. June peeked through a gap in the waving arms of forsythia and discerned the corner of a small white house. She detected movement, heard a creak, and realized that a man must be sitting on a porch swing. She looked at Ethan, who stared back at her. They were entirely concealed by the shrubbery and overgrowth—how could he have known they were there? “Hey!” Ethan said, uncertainly. He hiked up his hand and waved, causing his captive balloon to dip its broad, silvery head in a clumsy bow. He had mistaken the balloon for a passer-by. June sat on the ground and closed her eyes to keep from hooting. Ethan grinned but remained composed. June admired him and wondered if there might be a decided advantage to an extra four months of maturity. June snorted wetly into her hand, and Ethan coughed, loud and hoarse, to cover it up. “Don’t you want to come up here on the porch and have a cold drink before you start?” the man asked. June imagined that the man had to hide and find his own Easter eggs, too. The sound of a car coming up the road made Ethan and June look back. It was Daddy, with Uncle Scotty. The car slowed as it approached. “Thank you,” Ethan said, in a hurry. “Best be getting on,” and to June’s wonder and eternal delight he pulled the ribbon from his pocket and loosed the balloon. It drifted up slowly and bobbed drunkenly below the redbud tree. They heard the man on the porch swing exclaim, “Gah!” before the swing creaked crazily as he thumped into the house. June and Ethan ran back to meet the car, and jumped in the back. Up to your assbone in Weddlesville, June mouthed at Ethan, and the two stripes of color in his cheeks turned a deeper red and his eyes closed as he surrendered to the hilarity. Monday morning, Ethan and his family were to begin their drive back to Cincinnati. Ethan had a jar with June’s egg in it in the backseat with him, and another jar that June hadn’t seen before. “What you got in that one?” she asked, and he held it up for her to see an old Atlas mason jar with a heavy screw-on lid. Inside was a copy of the photo that Mama had taken of the two of them in their Easter clothes in front of the lilacs. June felt something strange inside her lungs, like she needed more air. “I’m going to go to the barn to watch your car go up Weddlesville Road,” she whispered. By the time she reached the barn window, the car had pulled out of the driveway and turned right toward State Road 79. Ethan had unsnapped his seat belt and leaned out the passenger-side window to wave. “Bye!” June yelled back. “We sure did!” She saw Ethan’s mama turned around in the front seat, trying to get him back inside and buckled up. Then all she saw was the back of his dark, bristly head and the gleam of a jar in his right hand. “Bye,” she said, again. She stood alone at the tobacco barn window, and when she could no longer see the car she looked to the left, toward Weddlesville. She stood there dreaming, wishing that she had a jar that she could keep Ethan in. Maybe she would get a copy of that picture, too. But she wouldn’t put it straight into a jar, as Ethan had. No, she would cut out their figures, letting the lilacs fall. She would get a square of fresh white paper and draw her own background of greenery and flowers, a section of driftwood fence, and put in a silver balloon rising up toward a redbud. Then she would paste the June and Ethan figures in that new setting, place the picture in a jar, and preserve their trip to Weddlesville forever. June looked toward State Road 79. It was empty now. 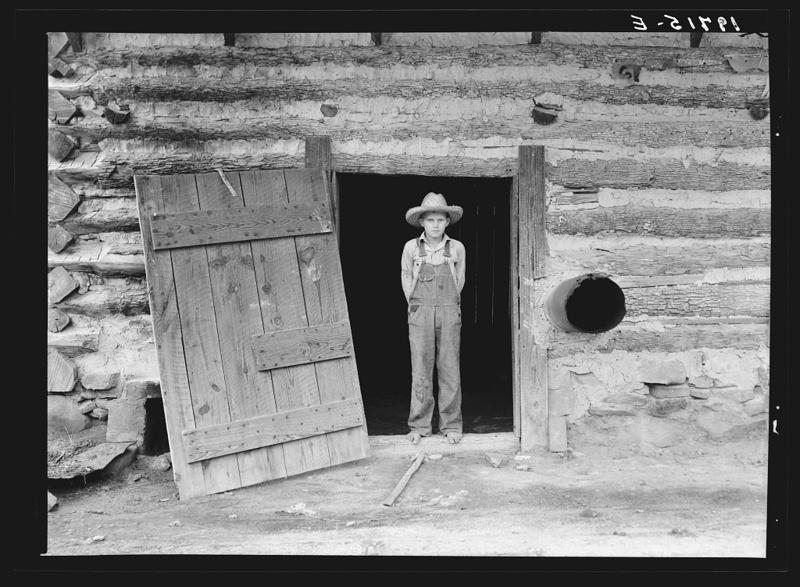 Her tobacco barn window seemed mighty big. June rattled in it like a loose tooth, grieved and aching, and certain to end up lost. I just love this, Vicki! It conjures up long ago feelings of all kinds. So sweet and lilting. I was curious after the first sentence about how it would end.